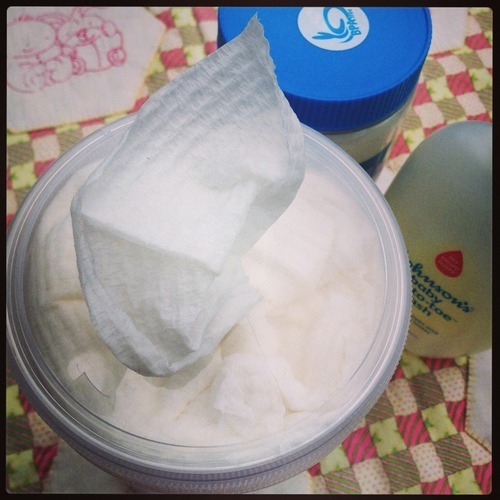 I mentioned in my Baby Wipes post a little while ago that I have a totally separate container and recipe to use on Miss G’s face and hands. The main reason is that she likes to lick when I wipe her face, and that the essential oils that I use in the baby wipes aren’t for consumption. Plus, I don’t like the idea of her licking baby oil off her fingers either. So, these wipes were born. I got the idea for the face wipes from a packet of ‘Sticky Fingers’ that my sister-in-law Ms R was using. Doing a bit more investigating at my local chemist, I found that not too many of the baby wipe brands doubled as bum/face wipes and those that did were quite expensive. I must confess, I bought a packet of the Gaia wipes before making these. I was travelling for 4hrs with Miss G on a V-Line train, and it made meal time clean up a bit easier. But $6 for 80 sheets…. I was cringing. So I took a knife to my baby wipes recipe and started cutting out all the stuff that would taste horrible and would be harmful to Miss G if she ate it. What I was left with was an even simpler wipe, and it still cleans! I found a lemon essential oil that was more potable than my other ones (please please please double check with your local health food shop if they are suitable for eating. If not, feel free to omit the oil), and it gives the wipes a nice refreshing smell as well as being slightly antibacterial. Another plus, I pop these straight in the compost after wiping Miss G’s face and hands! So why face wipes and not a facewasher? Well, I find it handier. It’s on the bench right near the high chair, I never have to rush around looking for a cloth, then getting it wet and adding a bit of soap… you get the picture. I just pull 1-2 wipes out of the tub and that’s it! Clean baby face and hands, very little fuss. The process of making these is still the same as the Baby Wipes, but instead of cooled boiled water, it needs to be warm to slightly cooled. 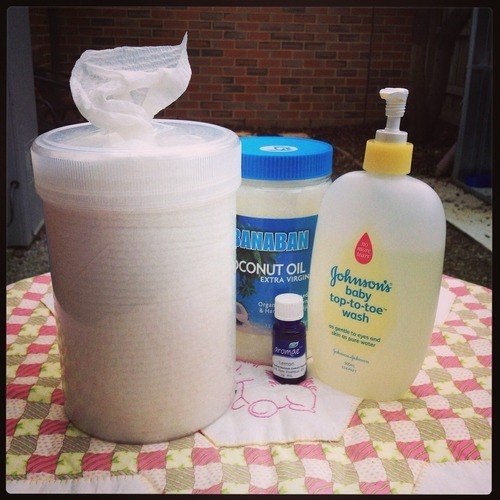 As there’s not that many ingredients to mix with the coconut oil to keep it liquid, we need the water to do that. Have fun with making another of my wipes! I assure you, I’m still making more variations. In a measuring jug, whisk together the coconut oil, baby wash and essential oil (if using) until it looks like white shampoo. Top it up with the boiled water to the 400mL line, then whisk to combine. 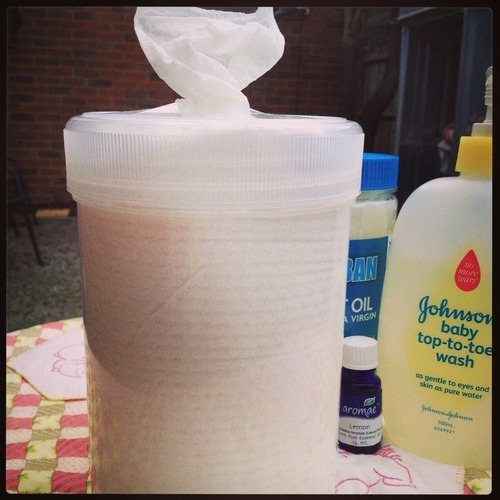 Notes: I got my container from Woolworths, it’s a 2Lt tall round container and it fits the roll of towel like a glove! The wipes do stand a bit taller than the container, but I just give them a squish down once I’ve fed the first wipe through. My hubby has also cut a hole in the lid so we can pull the wipes out easier. It’s not a pretty cut, as you can see in the last picture.